In cramming over 17 years of events in the lives of many larger-than-life musical icons into a two-hour movie, Cadillac Records ultimately does a disservice to them all, painting personalities with the broadest of broad strokes, reducing them to a series of disjointed life events. Aside from the spirited and impressive musical performances throughout, nothing rings true or remotely human, with the film mirred in cliché and perfunctory notions of identity. Performances from Jeffrey Wright, Beyoncé Knowles and Eamonn Walker certainly make this unseemly jumble of events more palatable, but a more thoughtfully constructed showcase of these talents could have easily made this film the musical epic it so desperately wants to be. What's more is that the character limitations and mishmash of history leave most of these luminaries swimming in their lowest life moments, coming across as vulgar ciphers. 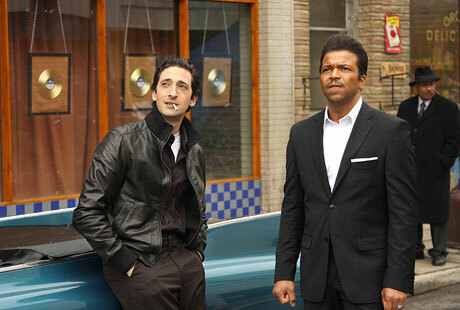 Chronicling the opening of Chess Records by sly businessman Leonard Chess (Adrien Brody) and its subsequent successes with Muddy Waters (Jeffrey Wright) and Little Walter (Columbus Short), whose crossover achievements brought a new style of music to mainstream America, Cadillac Records purports to be a biopic of a record label. Histrionics involving Chuck Berry's (Mos Def) predilection for young white women and Howlin' Wolf's (Eamonn Walker) foreboding presence come and go, as Leonard Chess's love affair with Etta James (Beyoncé Knowles) comes to the forefront, along with her substance abuse problems. While there is a certain low budget charm to the picture, using music as trajectory rather than pricey framing devices, there is simply too much going on for an audience to fully connect with. Part of the problem lies in the knowledge that any one of these musicians could carry a feature film with their own story, while the other problem lies in inept execution.